ERROR_CANNOT_COPY is a system error and it’s usually followed by The copy functions cannot be used error message. 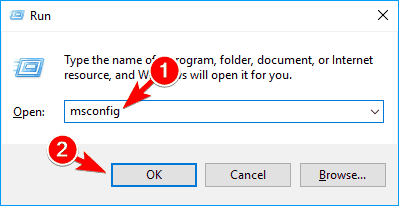 This error can prevent you from copying files and installing applications, so today we’re going to show you how to fix it on Windows 10. How to fix ERROR_CANNOT_COPY error? 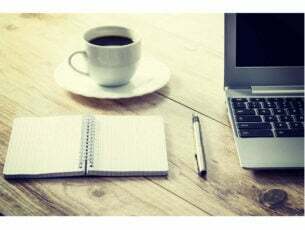 Antivirus software is important, but sometimes it can interfere with Windows and prevent you from installing certain applications. If that happens, you might encounter The copy functions cannot be used error message. To fix this issue, it’s advised to temporarily disable your antivirus. If disabling antivirus software doesn’t fix the problem, you might have to uninstall it. 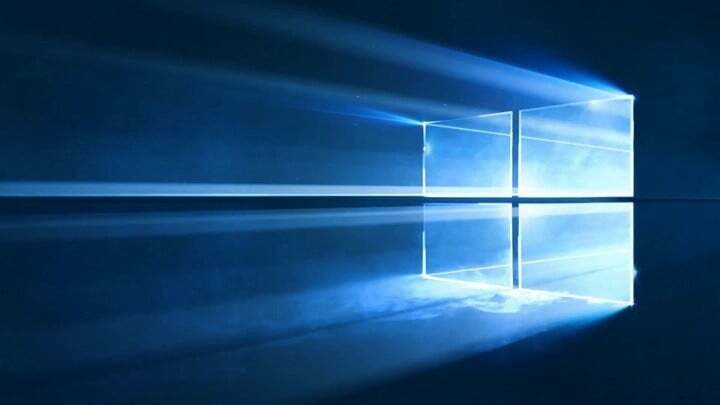 Even if you uninstall your antivirus, your PC won’t be vulnerable because Windows 10 comes with Windows Defender that works as a default antivirus. Keep in mind that antivirus tools can leave certain files and registry entries behind. These files can also cause this problem to appear, so it’s recommended to use a dedicated removal tool that will find and remove these files automatically. Most antivirus companies offer dedicated removal tools for their software, so be sure to download one for your antivirus. After removing your antivirus software, check if the issue still persists. If you manage to install the application, be sure to install the latest version of your antivirus software or switch to a different security solution. Almost any antivirus can cause this error to occur, but users reported issues with McAfee, so if you have this application installed be sure to remove it and check if that solves the issue. 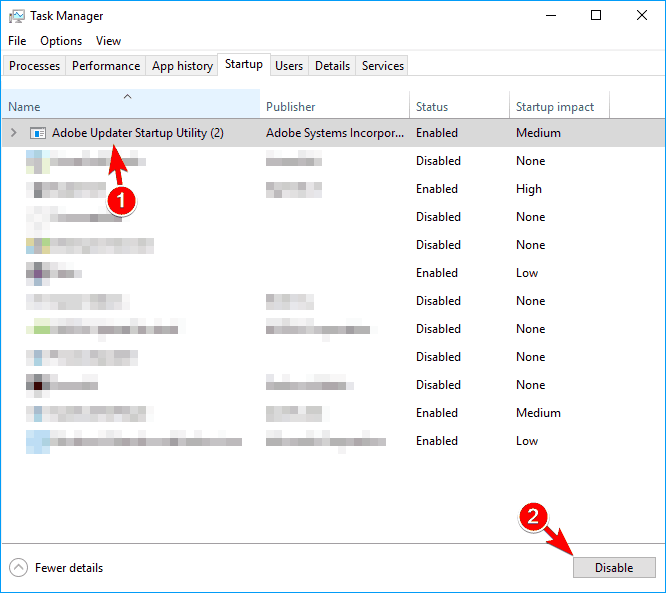 If you’re getting this error while trying to install certain applications, you might be able to fix it simply by copying installation files. If you’re running setup from a USB flash drive or optical media, copy the installation files to the root directory such as C: and try to run the setup file again. 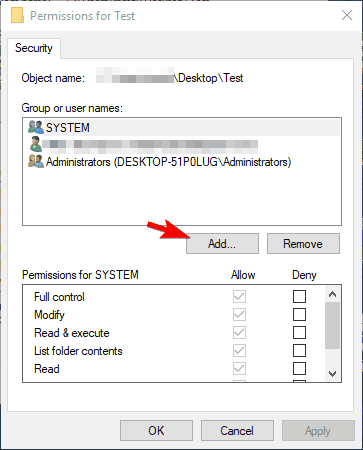 Some users are also recommending to disable your antivirus before starting the setup, so be sure to do that as well. After making the changes to the setup.ini file, save them and try to install the application again. Locate the setup directory, right click it and choose Properties from the menu. 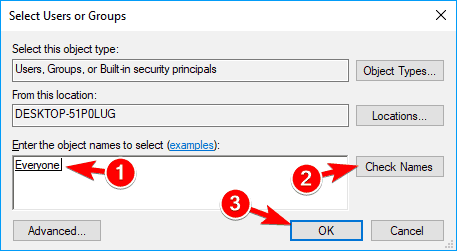 When Properties window opens, go to Security tab and click on Edit. In Enter the object names to select field enter Everyone and click on Check Names button. 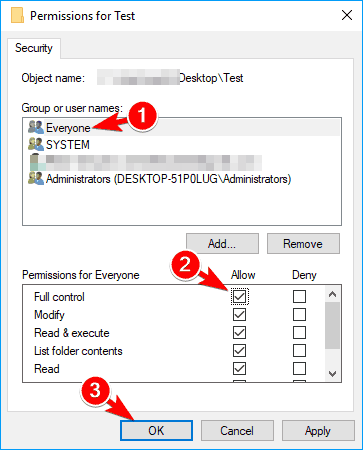 Now click OK.
Now select Everyone from the Group or user names section and check Full control in Allow column. Click Apply and OK to save changes. After doing that, all users will have full access to that directory and you should be able to install the application without any errors. Even though this solution is related to AutoCAD, you can also try it with other problematic apps. The copy functions cannot be used error message can appear if you’re trying to install software from optical media. To fix this problem be sure to clean your optical disc. To do that, simply remove the optical media and clean it gently with a soft cloth from middle to edges. After doing that, check if the problem still appears. If this error still appears on your PC, you might be able to fix it by inserting it to another DVD drive. Sometimes your DVD drive might not work properly, and it that’s the case, we advise you to insert a disc to another DVD drive on your PC and check if it works. If you don’t have an extra DVD drive, you can try inserting the disc on a different PC to check if it works. Go to Services tab and check Hide all Microsoft services option. Now click on Disable all button. 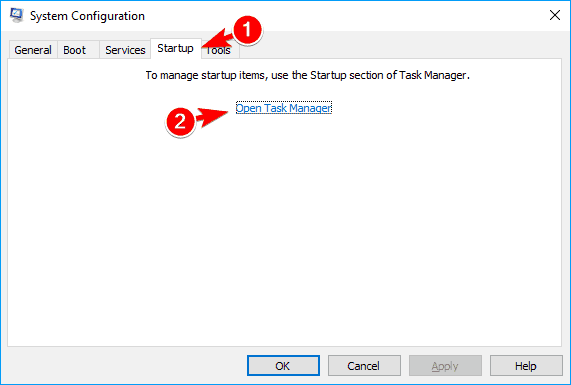 When Task Manager opens, you’ll see a list of all startup applications. Select each application on the list and click the Disable button. 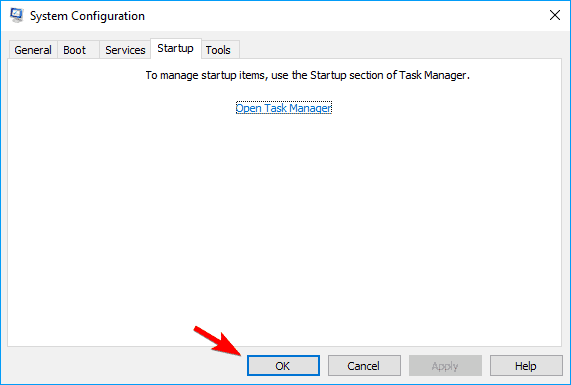 Once you disable all startup applications, close Task Manager. 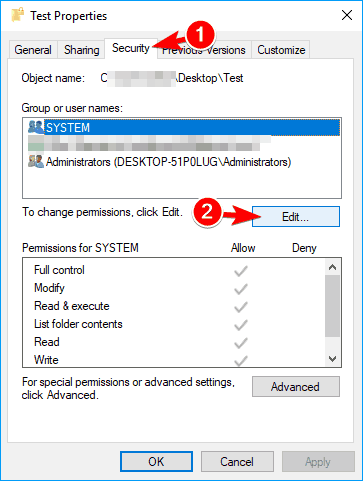 Go back to System Configuration window and click on Apply and OK.
After making these changes, restart your PC or log out and log back in to your Windows 10 account. After doing that, try to install the problematic application again. If you manage to install the app, repeat the same steps and enable all startup apps and services. 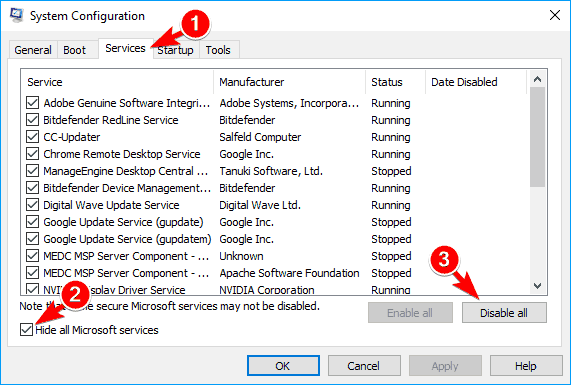 ERROR_CANNOT_COPY and The copy functions cannot be used errors can appear on almost any PC and prevent you from installing certain applications. This can be a problematic error, but you should be able to fix it by using one of our solutions.